312 Azusa Street in Los Angeles, California was originally built as an African Methodist Episcopal Church. Eventually the congregation moved on to another location, and 312 Azusa Street became a wholesale shop, then a warehouse, a lumberyard, a tombstone shop and a stable. The building was then rented for $8.00 a month to followers of a dynamic African American preacher named William J. Seymour. The building was cleared out of debris that had accumulated there, some crude benches were installed, and on April 14, 1906 a Pentecostal revival meeting was held, an event that is considered to be the launching of the international Pentecostal movement, which now has half a billion followers around the world. Brother Seymour was born in Louisiana on May 2, 1870 to former slaves, who had him baptized in a Roman Catholic Church but later took him to attend a Baptist Church. Louisiana at that time was the scene of some of the worst racial violence in the United States. Growing up in a culture in which the lynching of African Americans was commonplace had a profound impact on Seymour, who left the South as a young adult and eventually settled in Indianapolis. During his early adulthood he was exposed to preachers of the Holiness movement that had emerged from Methodism. Followers of the Holiness movement, which had adherents in several evangelical Christian denominations, believed in what they called a “second blessing,” an intense experience of salvation and of being cleansed of the tendency to commit sin. Participants in the Holiness movement typically stressed racial equality; what was important to them was the individual’s relationship with Christ as the personal savior, not with race, social class, economic prosperity, gender or other factors that differentiate people in mainstream society. William Seymour had such a “born-again” experience and for the rest of his life preached out of his conviction in the fundamental equality of all born-again Christians regardless of race. Seymour eventually attended a Bible school in Houston, Texas, where he acquired a belief that a person visited by the Holy Spirit acquired the gift of glossolalia (the ability to speak a divine language) or xenolalia (the ability to speak a previously unknown foreign language) as a proof of being saved and destined for Heaven. Before completing his studies in Houston, Seymour was invited to be pastor of a Holiness church in Los Angeles, California; he moved there early in 1906. Two weeks after arriving, he was expelled from the church that had hired him, because the congregation was shocked by his emphasis on speaking in tongues. After his expulsion from his church, Seymour was invited to stay in the home of a friend named Edward Lee. In April of 1906, after Seymour laid his hands on Lee, Lee began to speak in tongues. As word of the event made the rounds, Seymour gathered a congregation around him. After meeting in homes for a short time, the group rented the building on Azusa Street, after which time the movement came to be known as the Azusa Street Revival. Meetings for worship at 312 Azusa Street were not scheduled or advertised but took place spontaneously at any time of the day or night on any day of the week. There was no organized church body planning the worship services. There were no collections of donations. Although the majority of the worshipers were African Americans, the Azusa Street Revival attracted followers of all races and ethnic groups, not only those who were members of the Holiness Movement, but also Quakers, Mennonites and members of Baptist and Presbyterian congregations. Meetings for worship could have a few hundred attendees, with some meetings having more than one thousand. …they cry and make howling noises all day and into the night. They run, jump, shake all over, shout to the top of their voice, spin around in circles, fall out on the sawdust blanketed floor jerking, kicking and rolling all over it. Some of them pass out and do not move for hours as though they were dead. These people appear to be mad, mentally deranged or under a spell. They claim to be filled with the spirit. 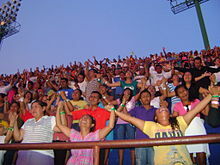 Thousands of enthusiastic worshipers who had attended the Azusa Street Revival went all over the world with the aim of spreading the word, some of them reporting chagrin that their gift of xenolalia did not enable them to communicate as effectively as they had hoped with speakers of Chinese, Bengali, Hindi and a variety of African languages. Within two years of the founding of the Azusa Street Revival, the movement had spread to more than fifty nations in Europe, Asia, Africa and the Americas. While the Azusa Street Revival itself was noteworthy for its racial integration and the prominence given to women, as the Pentecostal movement grew in the United States, and especially the southeastern United States, it tended to become racially segregated and more male-dominated. At an event commemorating the 100th anniversary of the beginning of the Azusa Street Revival, it was noted that Pentecostal Christianity is one of the fastest-growing Christian movements in the world, especially in Latin America, Africa, and all parts of Asia. In the United States its growth has been primarily in the southeastern states. The Pew Research Center claims Pentecostalism is not only the fastest growing Christian movement, but the world’s fastest religious movement of any kind. It is reported on numerous websites that approximately 500,000,000 people in the world adhere to some form of Pentecostalism or the closely related Charismatic and Renewalist movements. In the United States, people who identify themselves as Pentecostals, charismatics or renewalists are found in traditional evangelical churches, mainline Protestant churches, and in Roman Catholicism; a significant number have no affiliation with any Christian church, and some do not even identify as Christians. It is a movement that crosses many categorical boundaries. It is reported that in Latin America and Africa the Pentecostal movement has had a noticeable impact on the political landscape. 73% of Pentecostals believe that abortion should be illegal in all or most cases (35% say all, 38% say most), in contrast to 61% of evangelical Christians who hold that belief. 71% of Pentecostals believe that homosexuality is a life-style choice that should be actively discouraged, in contrast to 64% of evangelicals who hold that view. 50% of Pentecostals favor a larger government that plays a role in providing social benefits, with 60% saying government should do more to help the poor and the needy even if this means increasing the government’s debt. These views differentiate Pentecostals sharply from evangelical Christians, who tend to favor smaller government, fewer “entitlement” programs and fiscal conservatism. While fewer Pentecostals than other Christians register with either of the two main political parties in the United States, they report leaning more toward Republican than toward Democratic candidates. Only 11% of white Pentecostals would describe themselves as liberal, while 15% of black Pentecostals identify as liberals. In the overall US population, 20% of voters identify themselves as liberal, 37% as conservative and 36% as moderate. On the eve of the elections of November 8, 2016, CBN News reported that 61% of Pentecostal pastors said they planned to vote for Donald Trump, making them of all Christian pastors the group most likely to vote for the Republican presidential candidate. In contrast 50% of Church of Christ pastors, 46% of Baptist pastors and 38% of evangelical pastors said they planned to vote for Trump.